We learned today that Loren Wiseman had passed away, apparently from heart failure. Loren was one of game design's earliest "greats." 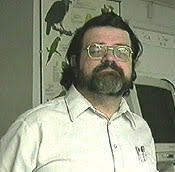 He was a founder of Game Designers Workshop and a co-creator of Traveller, the science-fiction roleplaying game that set the standard for all the others. He was also a good friend. He was inducted into the Origins Hall of Fame in 2003. Loren worked with Steve Jackson Games for many years: writing GURPS Traveller, editing the GT line, and creating an online incarnation of the notable Journal of the Travellers' Aid Society. Loren is depicted, along with the late Mike Ford, on the INWO "Evil Geniuses for a Better Tomorrow" card.